I arrived fairly quickly, but I think I was the last vehicle to drive right to the chapter, then the roads were closed off. The Red Cross chapter, being just a couple blocks away from the bridge was already set up as the staging area for all emergency responders, so the parking lot and surrounding roads were filled with police and fire vehicles, including a large mobile office which became their command center. I went directly into the chapter to a meeting that was just starting, which assigned volunteers to various duties. I was assigned to open a Family Assistance Center, which was to be located in the nearby hotel on Washington Ave, a Holiday Inn at the time. Because of this assignment, I didn’t see more of what took place at the chapter that evening. A Family Assistance Center is a place of comfort, a place to wait for information, a place to worry until your questions are answered. We had snacks and beverages available, which can help with stress. But mostly we had counselors: both the Red Cross stress team made up of Minnesota licensed psychologists, psychiatrists, social workers, etc. who are specially trained to work with folks stressed by the shock and uncertainty of disasters, and whether their loved ones are okay. Also we had a team of faith-based counselors such as pastors, priests, rabbis, chaplains, for those who find comfort in faith-based support. My thoughts of this event continue to include: appreciation for the preparedness and actions of first responders and the opportunity to help through the American Red Cross; encouragement for the survivors who continue to struggle with physical and emotional after effects of such a traumatic experience; and hope that our infrastructure is being updated and maintained so this doesn’t happen again. As family members arrived at the scene looking for loved ones, they were escorted to the hotel to share their story and concerns with a counselor and wait for information. Mostly these were people who knew their loved ones crossed the bridge about that time, generally their usual commute. Or if someone didn’t come home when expected, their family was worried thinking they had been on the bridge. One by one news arrived that a loved one was safe. Often it was by chance, they stayed at work late, stopped for a beer with a friend, took a different route either hearing the news or by chance. Some who were on the bridge were rescued safely, some taken in ambulances to hospitals, some bodies recovered. People were escorted out of the Family Assistance Center by their counselor, some greatly relieved, some in tears or grief. Over the course of the evening our clients became fewer until there was just one woman left. The divers finally located her husband, at the bottom of the river, a large piece of the bridge on top of him. It still affects me to think of what she and others went through that night. It was not possible to save every life, but our emergency responders found every single person. The Red Cross continued to support families and first responders for many weeks after the bridge collapse. Danielle Anselment received 40 units of blood that helped save her life. One year ago Danielle Anselment started to hemorrhage while giving birth to her fifth child. It was remarkable, doctors said, that she pulled through. Donated blood on the shelves made the difference. To save her life, doctors gave Danielle 40 pints of blood and platelets. Without it she might not be here to take care for her family. Her husband Shaun would likely be a single parent with five young children. She’s living proof, she says, that blood makes a world of difference. Danielle, who’s a sergeant with the Eagan Police Department, has joined forces with the American Red Cross and the 2016 Run for Blood, an annual event that raises awareness for the constant need for blood. This 5K run and walk, and community blood drive will be held on July 23 at Lake Calhoun in Minneapolis. The Run for Blood is fun summer event that supports American Red Cross North Central Blood Services, which provides lifesaving blood products to 108 hospitals in Minnesota, western Wisconsin, eastern South Dakota and northwest Iowa. Whether you are a blood recipient or blood donor, or you know someone who has needed blood, you can find a fit for participating in this fun summer event. You can form a team, join a team, donate blood, or cheer on runner and walkers. The Run for Blood is family-friendly, and new this year is a Pint-Size Corner featuring kid dashes, games, and face painting. Register online at redcross.org/mn. Blood donors can also sign-up to give blood using sponsor code “Run for Blood” in the free Red Cross Blood App. Same day registrations for the run/walk and to donate blood are also welcome. Each participant will receive a free tech T-shirt and swag bag with items and coupons from local businesses. The 2016 Run for Blood will raise awareness about the constant need for blood. Thank you to Run for Blood presenting sponsor Smiths Medical. Special thanks to our water sponsor Culligan and T-shirt sponsor Western National Insurance. And many thanks to the volunteers who help make this event a fun and safe event to everyone! If I can give blood, so can you. Spoiler alert: I survive the blood donation. This is a picture of me and my Red Cross bandage after I finished giving blood. 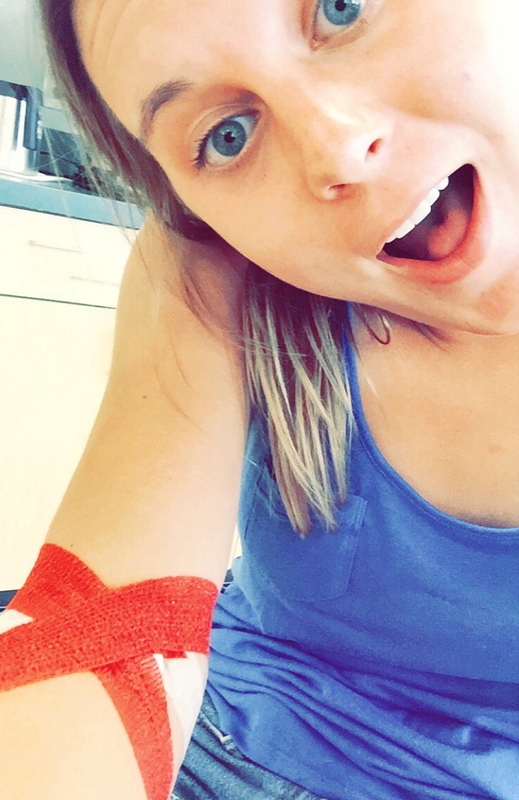 This is the story about my first time giving blood. I will not spare you the bloody details, because if I did, I would have nothing to write about. Remember that five-year-old who went in to get her flu shot and needed five nurses (all wearing ear plugs to mute the screaming) to hold her down? Well, that was me. Over time, I have learned to brave getting shots but never fully outgrew the anxiety that comes at the sight of blood and needles. I studiously avoided offering my arm for 20 years, even though I’ve witnessed firsthand how important donating blood can be. I had to swallow hard to overcome that fear, and the good news is, it wasn’t nearly as bad as I thought it would be. Monday, July 13, 2:15 p.m. rolled around much too quickly. A week after I had booked my appointment through the Blood Donor App, I found myself in the Red Cross blood donation center on the third floor at 1201 West River Parkway in Minneapolis. It was the ideal day to give blood. Outside was a blazing 89-degrees topped by an 83% humidity index, so even without giving blood, I felt sweaty and faint just from walking outside. The poster that trumped my fear of needles. 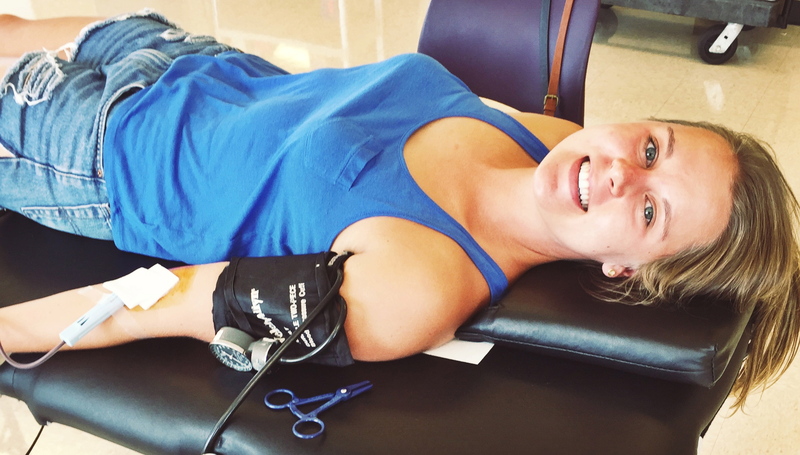 With time to spare, I scanned the waiting room until my eye caught a poster that asked, “Why do you give?” My mind initially jumped to ‘because my boss suggested it would be a good idea’, but then I realized I had many reasons to give blood—reasons that trumped my fear of needles. Blood donations help millions of patients in need. In fact, in the past few years, blood donations have helped some of the most important people in my life. My dad, handy man that he is, cut his foot open with a chainsaw a few years ago and he needed blood. This past ski season one of my best friends crashed into a tree and she needed blood. Even more recently, my grandfather died of leukemia. And while he was alive, he received blood transfusions that made him feel much better. The room where patients sit to complete their donation at the Red Cross blood donation center in Minneapolis. So I embarked on my blood donation solo. The nurse laid me down on my back in the middle of an open room that offered a great view of downtown Minneapolis. She explained that first-time donors must lie down as a safety precaution. I glanced around the room and noticed that everyone else was sitting up. Perfect, I was instantly labeled as the newbie. I get chatty when I’m nervous, and the nurse happily obliged, making small talk while she prepared my arm. At one point I asked how many donors they usually receive at this location. She guessed that an average of 15 people a day show up. There were at least 15, if not more, donors in the room at this moment. Word must have spread that I made an appointment and people came to witness the tears and screaming. Me in the midst of my donation! All smiles, no pain. Then came the moment I’d been dreading. The nurse told me not to look and slid the needle into my inner-left-elbow-crevasse (I don’t know how else to explain that spot on my arm). She did not stab or jab or pinch, she slid it into my arm. The needle entering was effortless, like it was meant to be there. OK that was an exaggeration, but it was manageable. 12 minutes and 43 seconds later I was done, and to my surprise feeling good! I looked at the pint of blood that had just come out of my body. The nurse saw me eyeing the bag and told me that my donation could help save up to three lives. Three lives? I asked if I had heard her correctly. She nodded and I sat, recovering from what probably counts as the most heroic, if somewhat anti-climactic, 15 minutes of my life. 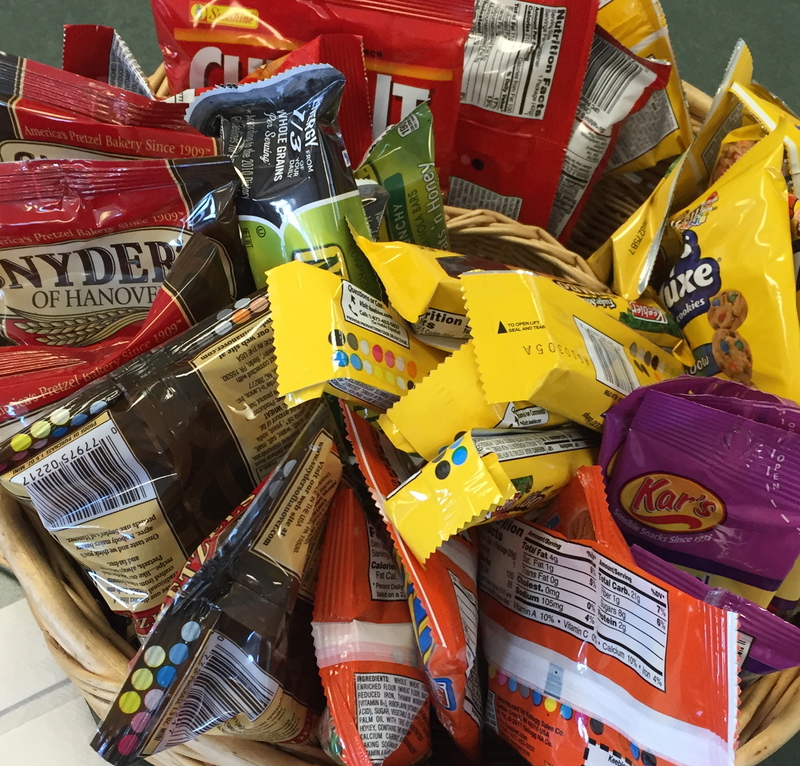 The snack bowl was wayyyyyyy less full after I left the blood donation center. After the nurses were convinced that I still knew my name and could stand on my own, they told me to slowly make my way to the snack table. I had been obedient for the last hour, but I admit, this time I broke the rules and hurried over to the food. First I enjoyed an M&M cookie, then I grabbed granola bar. Resisting a third snack might have been the most painful thing I did all day. As I sat indulging myself, I scanned the donation room. There were business people on their way home from work, seniors reading newspapers, even a few students like me. Everyone was sitting up, which meant that they were all experienced donors coming back to save more lives. I knew that I too would be back, next time sitting up like the veterans surrounding me, to participate in one small deed that can make a world of difference. So trust me: If I can give blood, so can you. And you’ll get a cookie. Help prevent a seasonal blood supply shortage: A seasonal blood donation decline is common during the summer. Currently, the Red Cross has an urgent need for type AB blood to help replenish the plasma supply. Blood donors with types O negative, B negative and A negative and platelet donors are also especially needed to maintain sufficient supplies. For information about blood donation, or to schedule an appointment, download the Blood Donor App, visit redcrossblood.org or call 1-800-RED CROSS (1-800-733-2767). 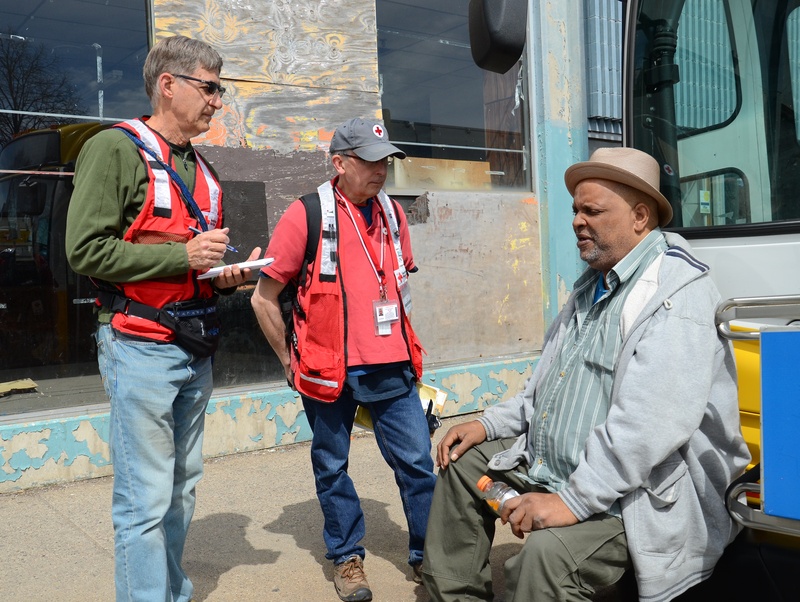 On Wednesday, April 22, we wrapped up our Red Cross sheltering operation following the devastating fire at West Broadway and Emerson in Minneapolis on April 15. On any evening during the week that that the shelter was open there were between three to six residents in who did not have their own resources to find safe shelter elsewhere. 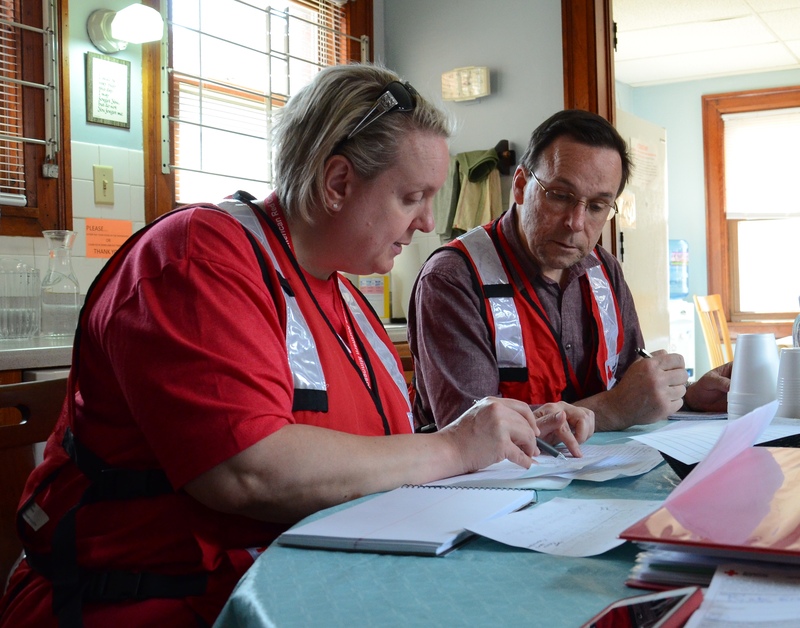 In addition to providing shelter, the Red Cross worked all affected by the fire to assess and meet immediate disaster relief needs and to start them on a path to long-term recovery. This important disaster response work happened both on location moments after the fire or later at the shelter or the temporary resource center established with community partners. To date, the Red Cross has helped 27 people who were displaced by this fire. We are grateful to have organization partners in the West Broadway and North Minneapolis community that have resources for these residents. We’re also thankful for the outstanding response from local businesses that helped us provide food to shelter residents. Working together, our community provided a strong safety net that many fire victims need to rebuild their lives. And most important to say is this: the Red Cross cannot do any of this relief work without the volunteers who shared their time and expertise during this response effort. Red Cross volunteers are the ones step into the gap left by disasters big and small, holding a hand, giving a hug, and doing the deep dive that helps get people going again after disaster strikes. Once again, our Red Cross volunteers were dedicated to helping others in our community during a time of great need and suffering. To become a volunteer, click here. To give a financial donation, click here. Preparing people to respond to emergencies is one thing the American Red Cross does –and does well. 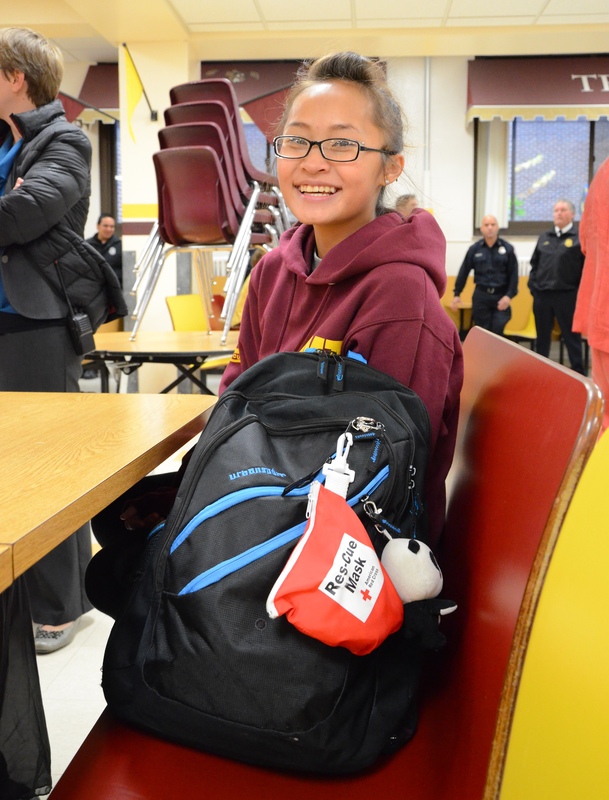 Now, eleven Roosevelt High School teens are ready to help save lives after successfully completing Red Cross Emergency Medical Response (EMR) training. The students received their course certificates during a ceremony at the high school on October 28. 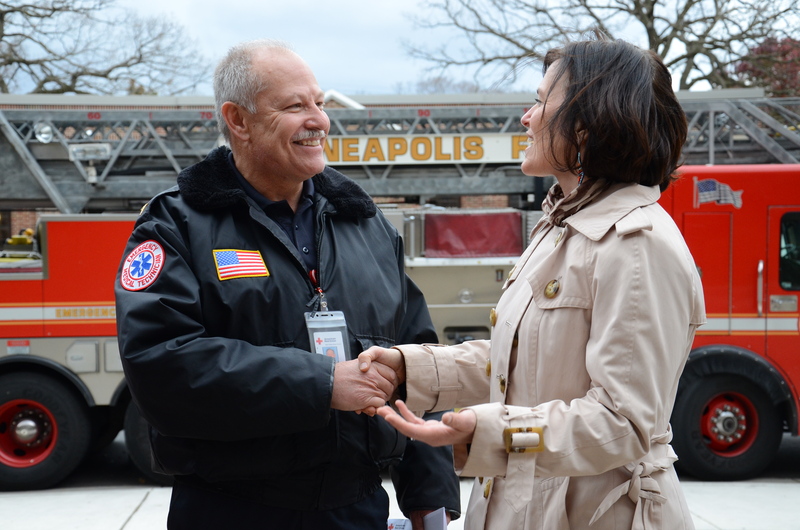 Minneapolis VIPs on-hand included Mayor Betsy Hodges, Fire Chief John Fruetel and Superintendent Bernadeia Johnson. All partner representatives are very thankful for the Red Cross and its work to help the Minneapolis fire department engage with local youth, prepare teens for fire fighting and healthcare careers after graduation, and add diversity to the fire department so that it better represents the community it serves. “Without the Red Cross we would not have gone as far as we have,” says Fire Chief John Fruetel. Also present to celebrate with the students and city officials was Red Cross instructor Steven Brown who taught the EMR course to the students. “When Steve was hired on as the instructor, I was confident that the students would be able to build a solid foundation of knowledge with Steve as their instructor,” says Kari Anderson Slade, Health Careers Program Coordinator at Roosevelt High School. As the instructor for this part of their first responder training, Brown had the honor of giving the teens their course certificates. “Steve has been extremely thoughtful about his role as a teacher of EMR this fall, but has also gone beyond this to recognize the importance of EMR, in the scope of the EMT program students are taking,” says Anderson Slade. 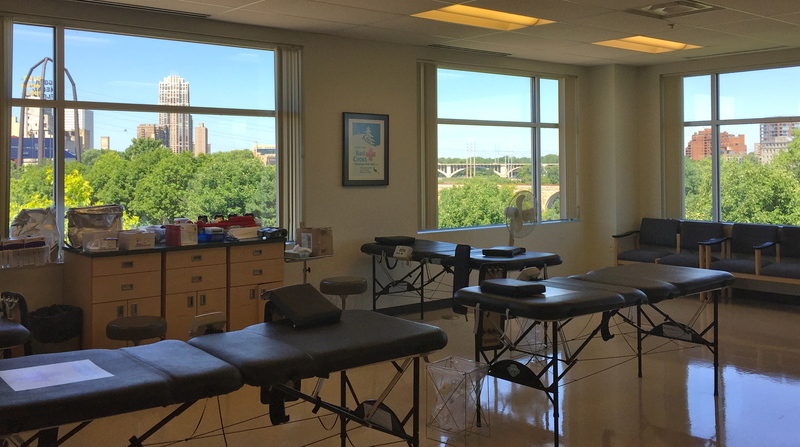 From here, the teens move on to the second half their training with Hennepin Technical College, which will prepare them to become certified Emergency Medical Technicians (EMTs). That is, of course, if they pass the test. If their current dedication and enthusiasm serves as an indicator of success, then they’ll likely get all As. Click here to learn more about American Red Cross healthcare and public safety training and certification programs. 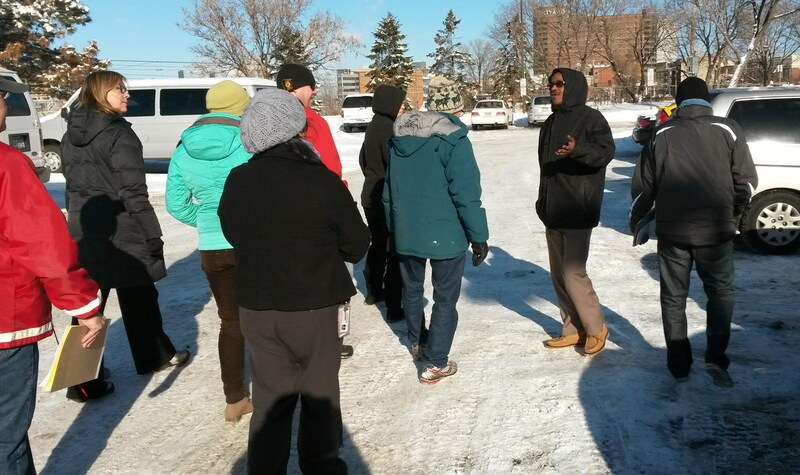 Red Cross and African immigrant community field trip, Minneapolis, MN, December 5, 2013. The tragic explosion and fire on January 1 in the Cedar-Riverside neighborhood of Minneapolis was a reminder for us that working ahead of disaster to reach out to diverse communities remains a top priority for the Red Cross. Most recently, on December 5, 2013, nine Red Cross volunteers and staff, representing multiple aspects of disaster prevention, relief, and recovery, met with five African immigrant community leaders to discuss the ways in which we could work together in a culturally sensitive manner. Together, we toured the Cedar Cultural Center, the Brian Coyle Center and areas around a Cedar-Riverside apartment building. Each step of the way there were conversations about the ways they could partner together on different projects including sheltering, cultural training, and preparedness. We know that connections made during this community walk-about, as well as previous community outreach activities, has helped lessen the stress of a tragic event and enabled the Red Cross and its community partners, both organizations and individuals, to provide emergency aid to people during a time of great need. Story and photo from Jenn Hamrick, a preparedness coordinator for the American Red Cross Northern Minnesota Region. Several community partner groups are taking donations for the Cedar-Riverside fire survivors. Click here for information about how to help. The Twin Cities Area Chapter was honored to host the April 9 meeting of the Minneapolis Downtown Council. More than 50 local business leaders joined us for lunch and learned more about preparing their families and organizations for disasters, including health and safety training, Ready Rating and AEDs (automatic external defibrillators). Participants also heard from Shane Zahn, with the Minneapolis Downtown Improvement District & Minneapolis Police Department, about personal safety workshops, the SafeZone initiative and more. Even B. Safe Bear got in on the fun with Council President & CEO Mark Stenglein (pictured right with B. 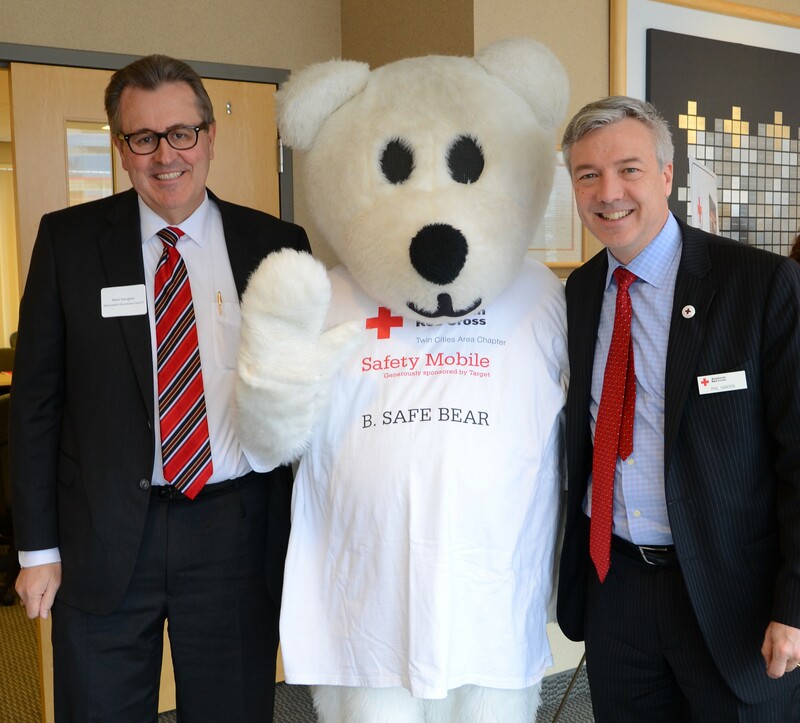 Safe Bear, center, and our Northern MN Red Cross Region CEO Phil Hansen, far right). Special thanks to all those who helped make the event a success!